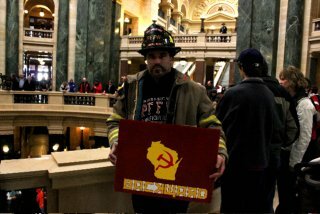 A firefighter inside the Wisconsin Capitol. Photos by Paul Christiansen. 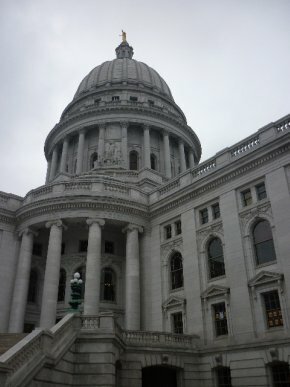 It has been three weeks since protests began in Wisconsin, and with no sight of an approaching conclusion, I wasn’t sure what energy I would find in the capitol on Monday. At the end of last week the State announced citizens could no longer sleep inside the capitol. It was beginning to stink. As I approached the imposing building I passed a few of the people that had simply moved their sleeping bags and posters outside. Half a dozen policemen at the door with metal detectors conducted security searches. The relationship between officers and protesters has been remarkably amicable with reports that at one point protesters chanted ‘thank you’ to the officers. While being forced to empty my pockets or answer questions about concealed weapons is never a pleasant experience, the officers at the entrance and the dozens scattered throughout the building existed as a calming presence. Many were casually talking to citizens and joking with each other. 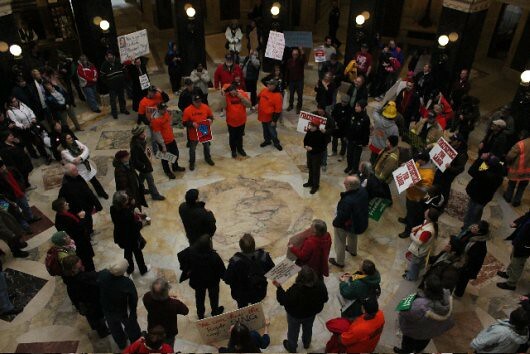 Since mid-February, hundreds of thousands of Wisconsin citizens have traveled to the state capitol in Madison to protest a proposed budget bill that many see as part of the Governor’s attempts to cripple the state’s unions. The national media has covered the rallies (including a visit from filmmaker Michael Moore this past Saturday) and unfolding drama (state senators fled to Illinois to avoid a vote; another representative was tackled when trying to enter the building; an audio of a damning prank phone call between the Governor and a billionaire oilman was released). The country has been watching Wisconsin as a sign of escalating frustrations surrounding federal and national financial predicaments and continued partisanship. During their first days of protesting, entire schools closed so teachers could attend the rallies alongside union members and students from the University of Wisconsin. The numbers on Monday dwarfed those initial thousands or the great crowds able to attend on weekends. Approximately a hundred protesters gathered in the circular center of the building’s first floor at noon. Many held signs identifying themselves as members of different groups (teachers, unions, firefighters) or attacking Governor Scott Walker. While small in number, there was no lack of enthusiasm. What’s disgusting? Union Busting! Kill the Bill! Wisconsin Can’t Be Bought! and Recall Walker! were amongst the chants let to echo off the capitol’s marble walls. The building fell to its quietest when one woman rose to lead the group in a singing of “America the Beautiful”. This near-hush was followed by the raucous cheers that accompanied the arrival of a group of Fireman who were there to show their support. 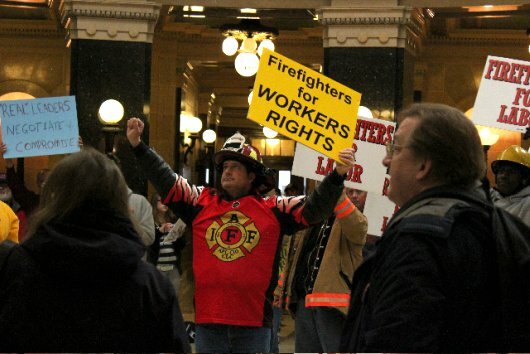 The primarily middle-aged, white Wisconsin citizens largely came to express outrage with the bill’s effect of striping public union’s collective bargaining powers. For some this would have very immediate effects on their jobs or those of friends and family. One woman I spoke with told me a story of how a friend would loose access to the doctors her sick child needed. Others saw the proposed budget as an unjust power grab that demanded opposition on principal alone. Names of wealthy citizens and corporations were mentioned as the benefactors of the legislation at the expense of the average, working citizen. Multiple people admitted to being Democrats who saw the bill as a Republican effort to rob power from their opposition. “It is really going to effect everyone,” said one woman who has been driving two hours each way every day to speak on behalf of those unable to attend. I was fortunate to speak to a few individuals in particular who exemplified the varied emotions and opinions motivating the protesters. Terry’s wife added that they have told their children to abandon plans to move back to Wisconsin. She feared the education her grandchildren might receive in a climate so hostile towards teachers. She also scoffed at suggestions that teachers receive too generous of benefits, revealing that both she and her husband paid for their own health insurance. Unfortunately my recording of the interview with Wisconsin firefighter, Cleveland, was mostly overwhelmed by people chanting in the background, but he provided me with some interesting insights. While fireman aren’t at risk for the same wage and benefit cuts as other union members, he recognized the need to stand united. He saw the plan as an attack on the proud tradition of the state, saying “We would loose collective bargaining and collective bargaining is what Wisconsin is built on”. Pessimism hung around the predictions people shared for the future of the state. The proposed bill could easily pass and have devastating effects on public unions. But maybe the protesters will succeed in seeing its defeat and the repeal of Governor Walker. Whatever the outcome, the hundreds of thousands who have demonstrated in Madison over the past several weeks want it made clear to their government and the nation as a whole that their peaceful opposition represents the will of the average citizen. That this is the Wisconsin way. Post, photos, and audio interviews by Paul Christiansen of Wisconsin.